My husband and I often eat out at our favorite Mexican restaurant. When we do, you can guarantee that at least one of us will have chile rellenos. This Mexican staple features chili peppers stuffed with meat and cheese. 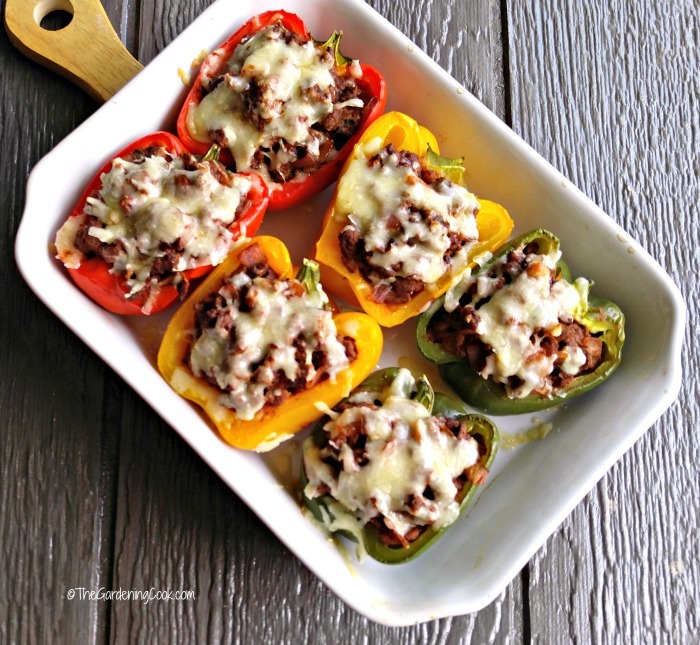 Since my husband is the lover of heat in recipes and I like things a bit more savory, these recipe for Mexican style stuffed peppers is my compromise that suits us both. Thank you ¡Sabor! by Texas Pete® Mexican-Style Hot Sauce for sponsoring this post. All opinions are mine, alone. I get to use bell peppers and my husband gets the taste of one of our newly discovered and now favorite hot sauces: ¡Sabor! by Texas Pete® Mexican-Style Hot Sauce. We were delighted to try this product because it was made right here in North Carolina – in Winston Salem! 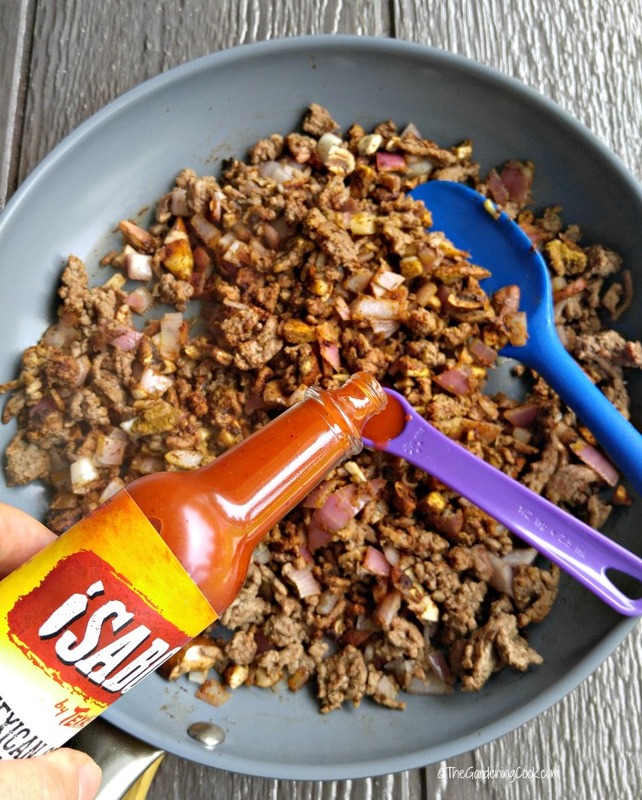 This hot sauce adds an amazing flavor to all my Mexican styled recipes. It is bold, but has a great combination of spices, sea salt, garlic and aged peppers. This makes it perfect for my recipe. It tastes amazing with all my other fresh ingredients, too. 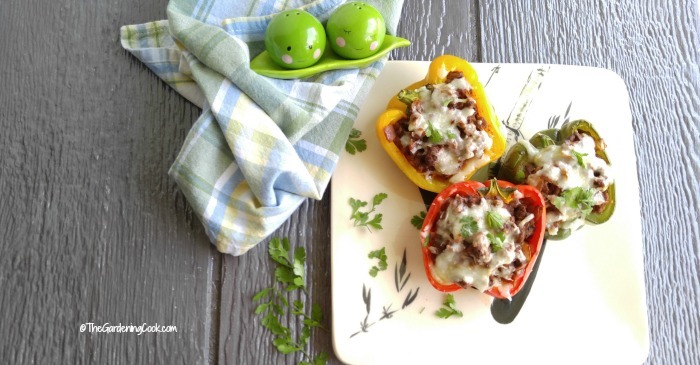 Liven up the Taste Buds with these Mexican Style Stuffed Peppers. The name of this hot sauce comes from the word “sabor” which means “flavor” in the Spanish language. How aptly named it is, too! I love color in my recipes, so I chose the stoplight red, yellow and green peppers. Dontcha just love the name stoplight? This recipe gets a green light all the way, though. It is rich and flavorful and gluten free, since I am not using rice, bread crumbs or any other carbs for the pepper filling. Just delightful fresh flavors and spices. I started by cutting my peppers in half and covering them with parchment paper and then plastic wrap to soften them a little in the microwave. This saves cooking time in the oven and insures that the melted cheese does not get overcooked during the time in the oven. While the peppers were cooking, I made the ground beef mixture. Chopped mushrooms, red onion and a wonderful blend of spices are combined with the Sabor hot sauce and tomato sauce for a delightfully aromatic filling mix. You can add as much or as little hot sauce as you like. I used 1/2 tsp the first time I made these. When I tasted the mixture, it was nice and spicy, but when I filled the peppers and put them in the oven, the sweetness of the peppers made them more savory. So, if you love spicy food, 1 tsp is just right. Now it is just a matter of adding the mixture to the steamed peppers and sprinkling some sharp cheddar cheese over the top of the stuffed peppers to add a gooey finish. Into the oven they go until the cheese has melted and the peppers are nicely softened. 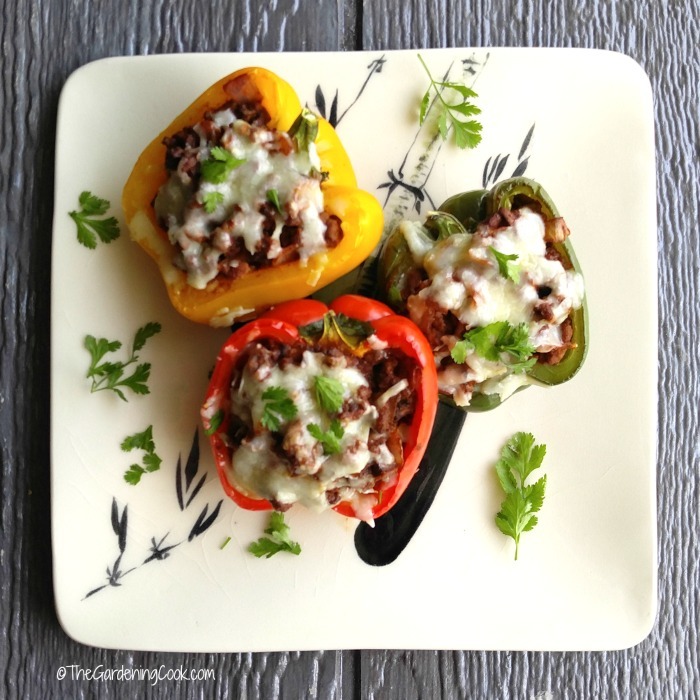 The flavor of these Mexican style stuffed peppers is amazing. They have a bold and spicy taste that is not too hot, and the melted cheese gives just the right amount of gooiness to please the most ardent comfort food eater. Even with the cheese they are still reasonably light and healthy, since I only used 1/2 cup of cheese for all 6 servings. The next time you are shopping, be sure to add a bottle of ¡Sabor! 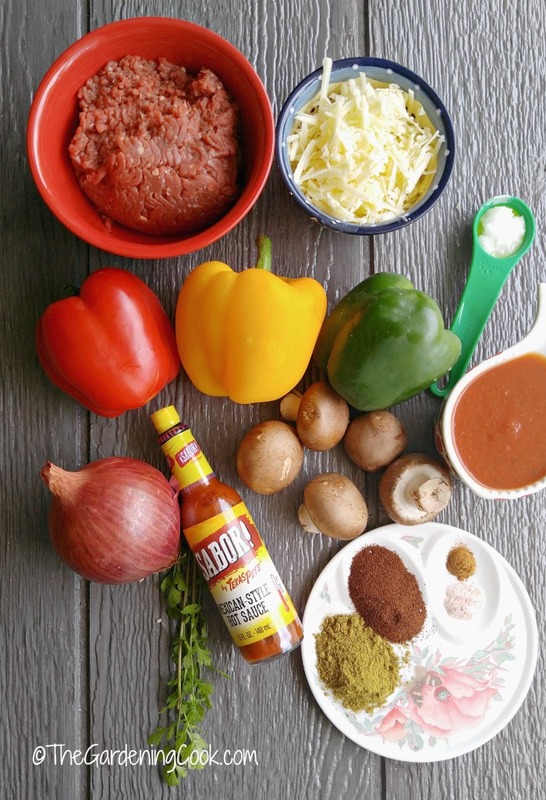 by Texas Pete® Mexican-Style Hot Sauce to your shopping cart. It is the perfect way to add extra flavor to anything from nachos, enchiladas and tacos to grilled chicken or beef. These Mexican style stuffed peppers are perfect for Cinco de Mayo. See more Mexican inspired recipes for my recent progressive dinner party. And add a cocktail to your meal with a Michelada – a Mexican bloody Mary. Bottoms up! 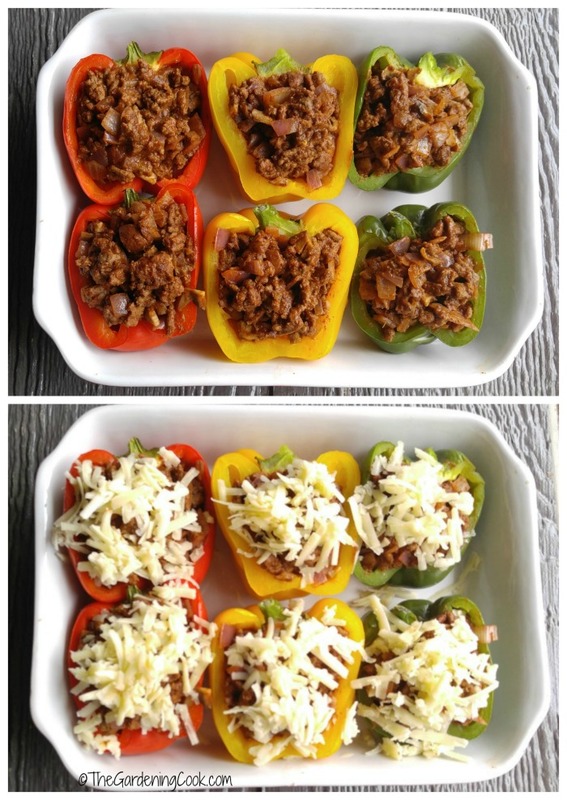 These stuffed peppers features chili peppers stuffed with meat and cheese. 3 large bell peppers, cut in half, seeded and cored. I used the stop light peppers for color. Place the peppers, with the cut side down in a microwave safe baking dish. Add 1 cup of water, and cover with a layer of parchment paper. Place another layer of plastic wrap on the top and microwave on high until the peppers are just starting to soften, about 4 minutes. Remove the wrappings and drain the water. 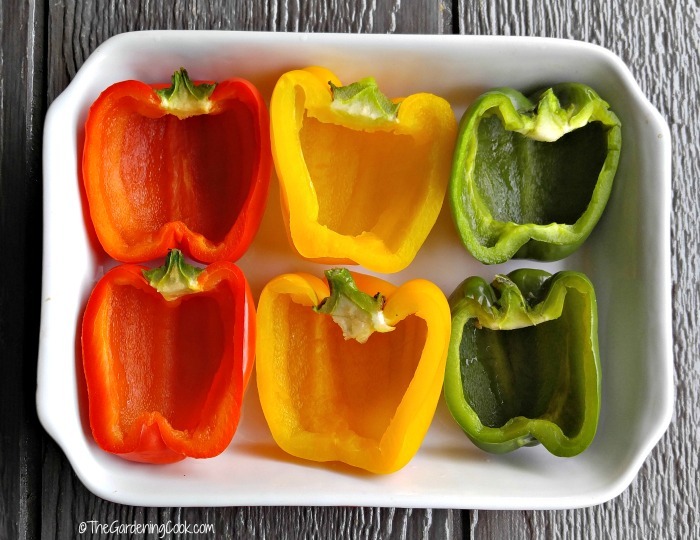 Place the softened peppers in an ovenproof baking dish, cut side up. Add the ground beef and cook until the meat has browned, about 5 minutes. Add the chopped onion and mushrooms and cook, stirring often, until the vegetables have softened and the meat is no longer pink, 4 to 6 minutes. Stir in the cumin, chili powder, Sabor Mexican style Hot sauce, salt and cinnamon and cook until the spices are fragrant, about 30 seconds. Remove from heat and stir in the tomato puree. Fill the peppers with the meat mixture. Top with the sharp cheddar cheese. Place the baking dish in the preheated oven, and cook until the cheese has melted and the peppers are tender - about 10-15 minutes. Serve warm, garnished with chopped fresh cilantro. 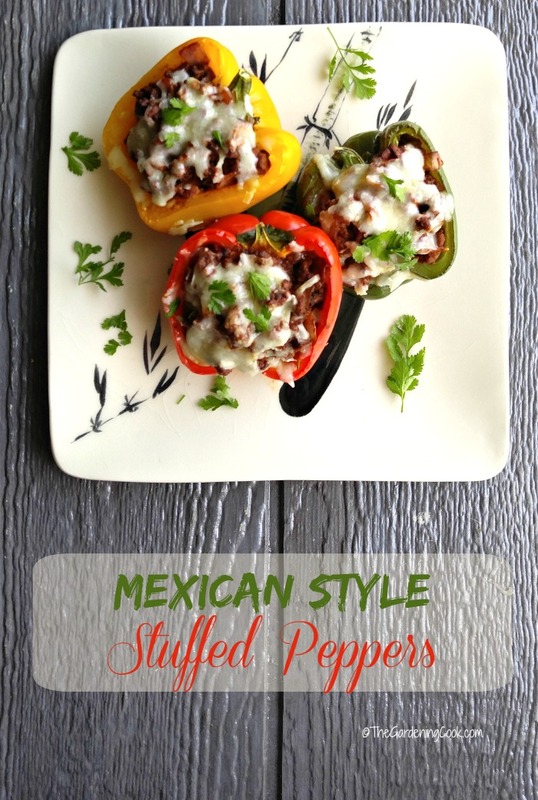 I love stuffed peppers, and stuffed Mexican style pepper has to be even better. Thanks for sharing the recipe!